Oh Snap! The Friggin Amazing J.Ho Sketchblog...: Accept No Substitutes? ALSO: BONUS WALLPAPER!!! The subject of today's mega-nerdy post is Faker. 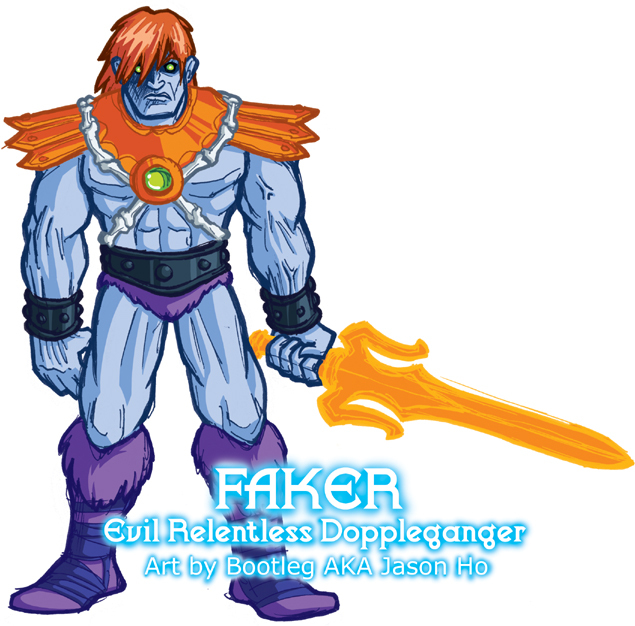 Faker's original title was "Evil Robotic He-Man Imposter," but in Faker's single appearance in the classic He-Man cartoon, he was identical to He-Man and conjured by Skeletor with magic. Combining the technological and magical origins of Faker, and envisioning my take on the character as something of a cross between a zombie and a Terminator, I gave him the title "Evil Relentless Doppelganger." Relentless is, of course, a nod to how Terminators are frequently described, and doppelgangers are creatures from folklore and, um, Dungeons and Dragons. This one is a little unusual for a few reasons--for one, I don't usually render shadow with line art, and as you can see, one side of his face is pretty heavily hatched. Also, the way I drew and colored the highlights in his hair is different from the more simplistic way that I usually depict hair. I think it worked out alright. Some notes on the colors themselves--the power sword is supposed to be a mystical construct, generated by Faker's battle aura. This was an idea I came up with to explain why Faker's sword would be bright orange. Faker's green gem and green eyes are supposed to be a callback to my take on Skeletor--if you refer back, you can see that I colored Skeletor's gem green as well. The idea is that the gem is not merely for show, and serves some kind of mystical function. 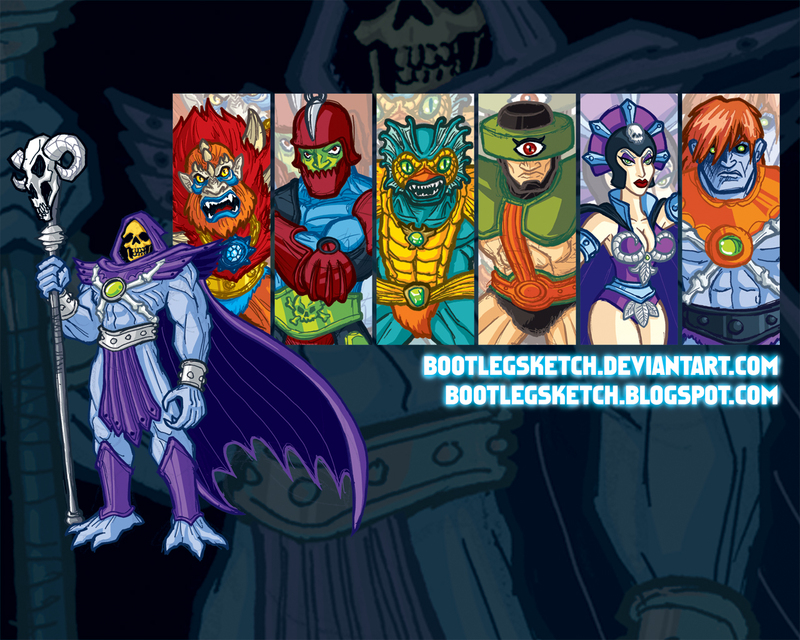 Since Faker was always something of a cross between He-Man and Skeletor, perhaps it is through the twin gems that Skeletor imbued part of his essence into Faker. If you look to this week's earlier post, you can see that I gave Evil-Lyn a green gem and green eyes as well--the idea is that she's drawing on a similar source of power as Skeletor. I spelled "doppelganger" wrong in the picture. I'm too lazy to change it. I am a bad person. Goo job, old bean. I like this one, tho the colors don't really pop too much for me. The hair does in juxtaposition with the skin tone, but it also makes the color scheme seem a bit top-heavy (the bright colors jump forward towards teh eye moreso than the blues, thus he seems like he's leaning forward a bit... not a criticism there... it actually gives him a bit more of a 'shambler' feel and thus helps validate your zombie idea). As for gavin's desire for something non-He-Man, I support that. I've nothing against He-Man, per se. I'd also just like to see more variety in your subject matter. Why not draw Thundarr in an epic battle with Shaak Ti or even that accursed Demon DogDarth Malak (shakes fist angrily). 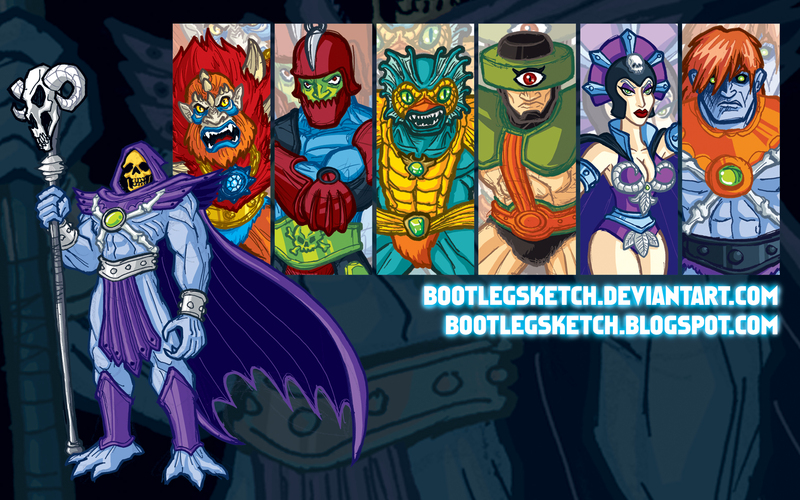 Or at least good ole Bruce and Kit Fisto vs. Skeletor and Serpentor. In the very least you could have had Faker battling "Skrullverine", a Skrull that had come to earth in the guise of Wolverine. lord shen: thanks for the comments--i'm probably not going to get into a lot of versus pics, though i wish i had the time to do so--those are some pretty cool eclectic team ups you listed! however, shaak ti was already requested by someone else, so she's in the works. kit fisto is, visually, one of my favorites, but i haven't come up with a rough that i'm happy with yet. there's also one more jedi w/ lekku that i'm drawing up. any guesses? ;) and for referencing barney's b-day... +200 nerd points.